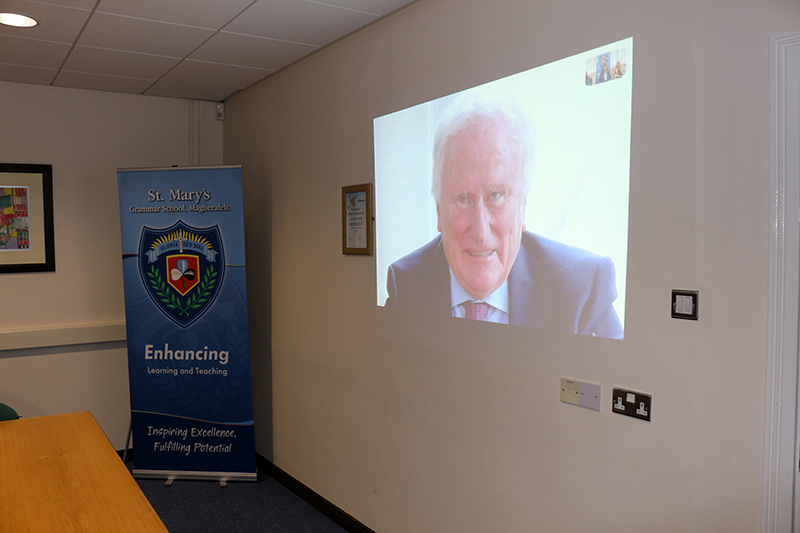 ​On Wednesday 27 March 2019, a group of senior students spoke to Lord Kerr via a Skype call. Through a series of questions, Lord Kerr discussed a range of issues relating to neutrality as a judge, ethics in legislation, how social media has changed the face of law, the future of UK law with Brexit and he also reflected on prominent and controversial cases that he ruled on which have left an indelible mark on his memory. Lord Kerr’s personable and relatable manner emerged as he spoke to students about their career pathways and the importance of embracing uncertainty if they face indecision in choosing a particular career. He spoke about his family frequently throughout the session which allowed students to see the human side of a Supreme Court Judge. In closing the 45 minute conversation, Lord Kerr parted with words of wisdom for students - encouraging them to have a passion and enthusiasm for the career direction they pursue. Lord Kerr particularly encouraged female students to embrace the challenge of closing the gender gap in the field of law. Lord Kerr was educated at St. Colman’s College, Newry and read Law at Queen’s University, Belfast. Serving as Lord Chief Justice of Northern Ireland from 2004 to 2009 he became a Justice of the Supreme Court in October 2009. Lord Kerr is the first Justice of the Supreme Court to come from Northern Ireland. He opened the discussion with students by recalling his family connections with the local Cookstown and Magherafelt areas. Having researched the school prior to the event, Lord Kerr commended the school and its students on the diverse range of academic and extra-curricular achievements, most notably the school’s MacRory Cup success in recent years. This was a unique learning experience and the students involved greatly appreciate the time Lord Kerr took to speak with them. Senior students spoke to Lord Kerr via a Skype call.